Looking for Wisconsin geodetic control? 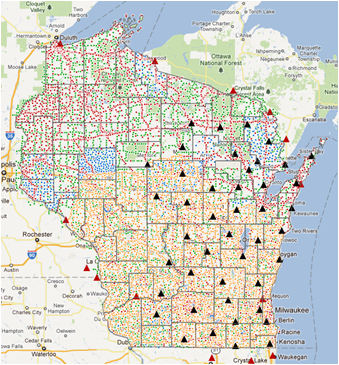 With a new version released early in 2011, ControlFinder continues to provide a central point of access to Wisconsin’s geodetic control data from distributed sources. ControlFinder is designed as a free, online catalog providing a common entry point for locating local control established by Wisconsin counties. We currently host 20+ counties (St. Croix being the latest addition), representing a statewide integration of control data from the National Geodetic Survey (NGS) database, published WI-Height Modernization Program control, historical U.S. Geological Survey 3rd order vertical control, Wisconsin Continuously Operating Reference Stations (WISCORS) and NGS CORS stations. Users can retrieve control point attribute information while other relevant control attributes may be available via direct links to digital tie sheets (datasheets) that are maintained by the contributor on their Web sites. Contributing geodetic control information is encouraged in any of these formats: geodatabase, shapefile, dbf, xls, or mdb. For more information on ControFinder, please contact Brenda Hemstead at (608) 263-4371, or visit it online at maps.sco.wisc.edu/ControlFinder.